eBay is running another sitewide sale today, but only until 1 pm PT (4 pm East Coast). Up until last month these types of flash sales had been rare, since unlike its Daily Deals, eBay has to subsidize them. Today’s sale is meant to encourage buyers to download the eBay mobile app. The promotion gives buyers 15% off purchases of $50 or more – but the coupon (code: PLAN2SAVE) is only valid when buying within the latest version of the eBay Mobile App on iOS or Android. Be sure to read the promotion terms carefully for details and restrictions. 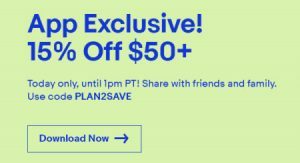 This Coupon is a 15% discount valid from 8:00 AM PT on April 26, 2018 until 1:00 PM PT on April 26, 2018. Discount applies to the purchase price (excluding shipping, handling, and taxes) of eligible item(s) of $50 or more on the latest version of the eBay app and is capped at a maximum value of $50. Eligible items exclude items from the Coins & Paper Money, Gift Cards & Coupons, and Real Estate categories. Coupon can be used once within a single transaction (or cart), while supplies last. Only eBay users registered with an address located in the United States or Canada are eligible for the Coupon. Any unused difference between the discount amount, as shown on the Coupon, and the purchase price of an item(s) in a single transaction (or cart) will be forfeited.